Combining elements of nature and manmade environments Ron Bimrose’s work explores the mingling of the line, the paint and photographic images. He creates images of the interconnection between humans and our environments while examining the dissimilar, creating associations and connections to our everyday lives. 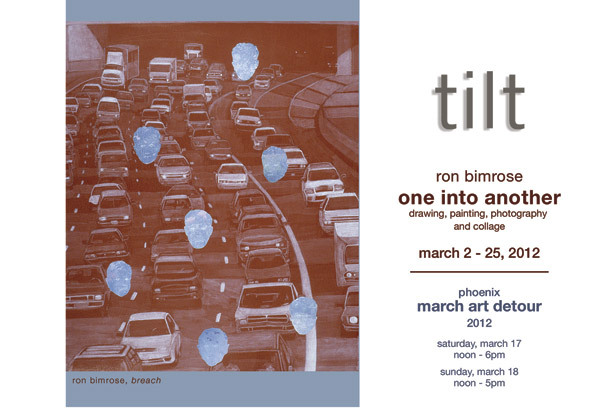 Ron Bimrose is an educator of fine art at Mesa Community College and has his studio in Tempe, Arizona. In the late ‘60s, he bought his first camera. He purchased it for the purpose of recording objects for his drawing and painting, his first artistic pursuit. Photography took over. More than a decade later it was printmaking that guided him back to his roots in drawing. Today he uses all the tools he honed over decades of work: drawing, painting, printmaking, photography and collage. This mixed-media work has earned him a Visual Arts Fellowship from the Arizona Commission on the Arts and inclusion in numerous private and public collections (including, the National Baseball Hall of Fame, Cooperstown, N.Y.). Scottsdale Museum of Contemporary Art, Scottsdale Arizona, Chase Special Collections Center, Carol Reece Museum, Plains Art Museum, Northlight Gallery, Arizona State University, Tempe, Arizona, Kennedy Museum of Art. Robert Schumann composed the piece in 1842 and these photographs are created with processes and techniques contemporary with Schumann’s composition. They are printed on watercolor paper using the salt printing process, the predominant method of the time. These images were inspired and created to accompany a superb performance of Schumann’s classic 19th century work Dichterliebe (A Poet’s Love) as performed by the Pittsburgh Song Collaborative. The concert featured piano virtuoso and musicologist Benjamin Binder and the internationally recognized baritone Troy Cook at the Pittsburgh Opera’s Black Box Space on November 18, 2010. A haunting emotional journey, of yearning, bitterness, despair, and ultimately consolation. 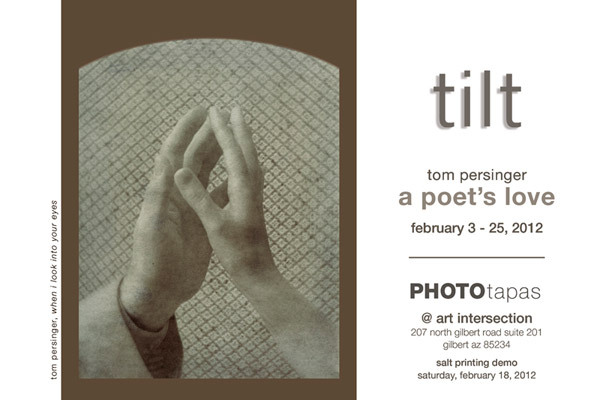 Tom Persinger is an artist, photographer, writer, and the founder of F295. F295 is an international organization that believes in the value of a heterogeneous photographic approach, in which contemporary, historic, and self-made methods are employed and combined in the creation of a new “21st Century Photography.” He organizes the F295 symposium and seminar series to promote the exploration 21st Century Photography. Persinger’s photographs have been shown in numerous exhibitions and are in many private collections in the United States, Europe, and Japan. He has been published in Photographic Possibilities (3rd Edition), Light and Lens (2nd edition), Afterimage, Ag, Black and White Photography (UK), PhotoEd, and View Camera. He has lectured at numerous colleges and universities, has lead many workshops, is a member of Freestyle Photographic’s Advisory Board of Photographic Professionals, and is an Adjunct Assistant Professor at Pittsburgh Filmmakers.